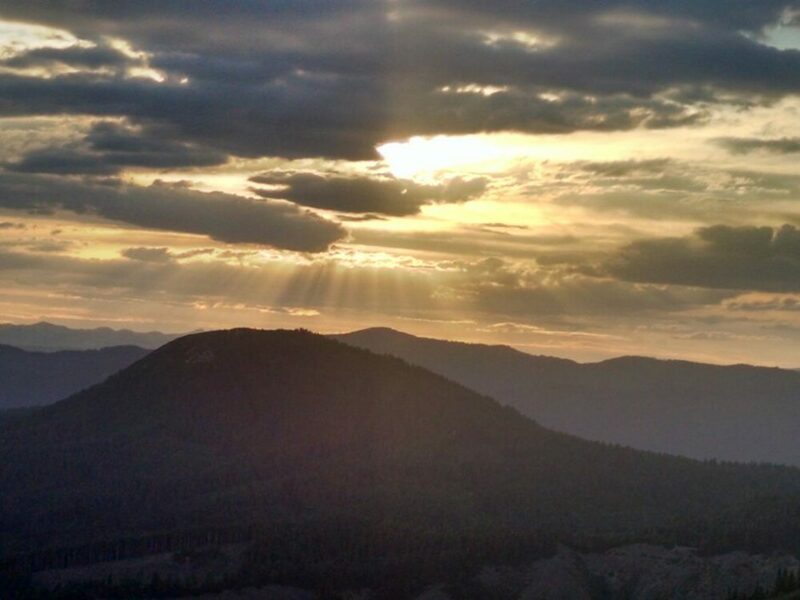 PCT 2018 Day 69, June 30, Saturday. 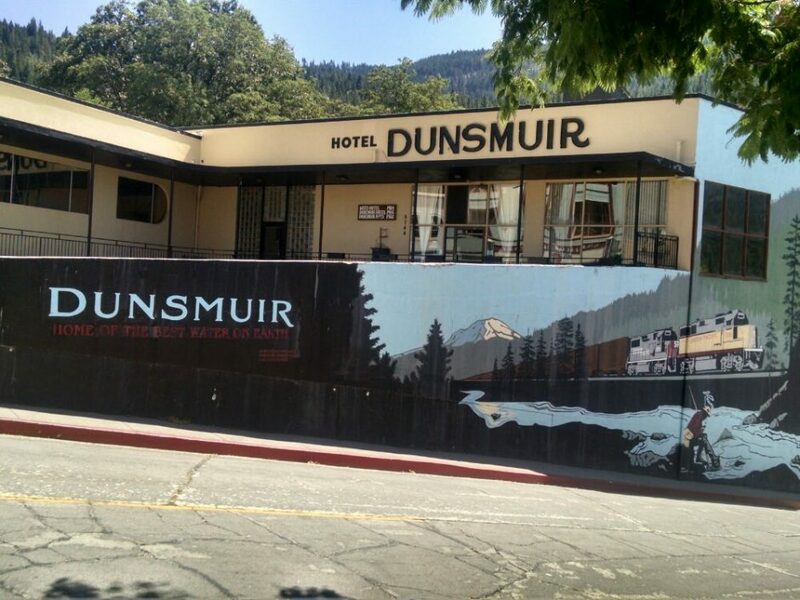 Walking down to Interstate 5, I got a ride into Dunsmuir, a small tourist town about five miles away. I met Salty and Wifey, who had found a ride together, and we had breakfast together. My omelet had Hatch green chile, and several servings of hot tea helped make up for going no-cook on the trail. 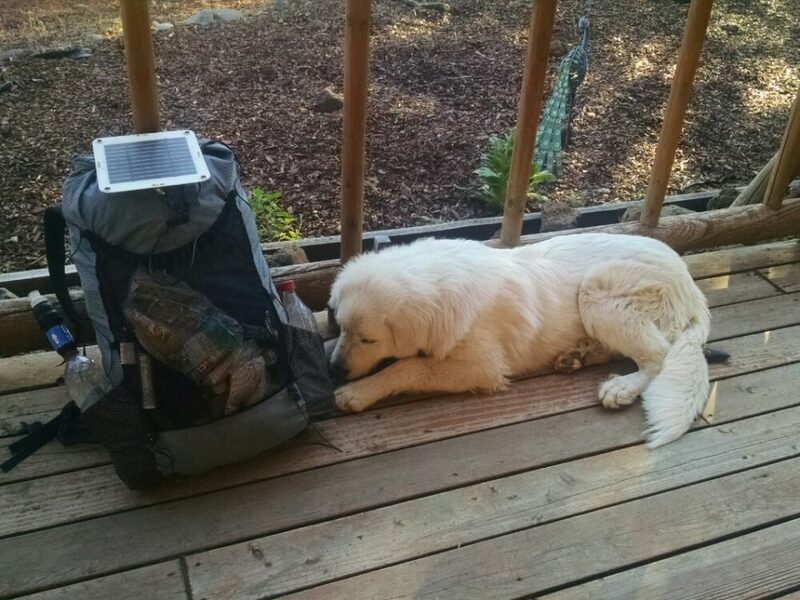 Afterwards, each of us go to the grocery store to resupply, and by now each of us have our own system to estimate the right amount of food and repackage for the trail without wasting too much time. Later I go to the library for wifi, but cannot update blogs because their system is too slow, but I find a business with open wifi and finish the task. Wifey leaves town quickly after packing a sandwich, but Salty and I stay for separate lunches and return together. With full packs, our task is to climb from 2.2k elevation to around 6k, starting in the heat of the day. Smokey pulls ahead, doing well on uphill. 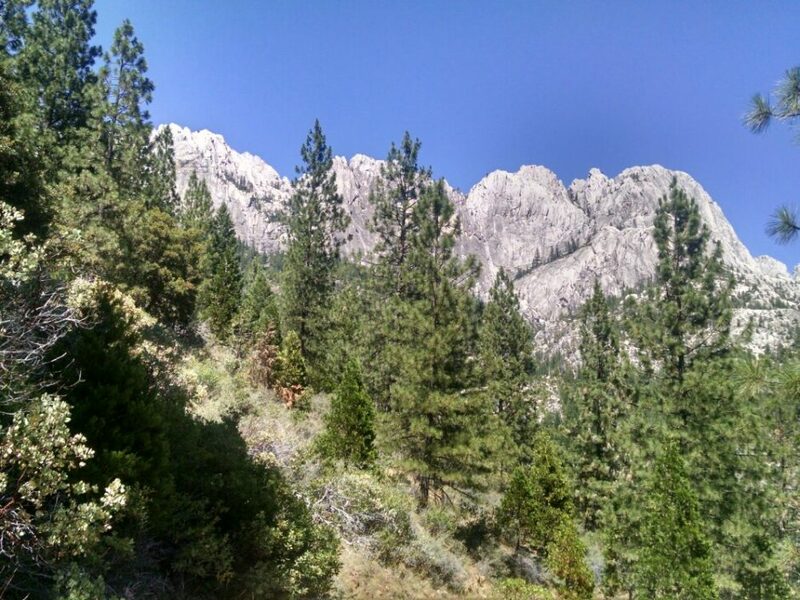 The rock formations of Castle Crag state park are impressive, visible for the rest of the day as I climb ever higher on the ridge. PCT 2018 Day 68, June 29, Friday. 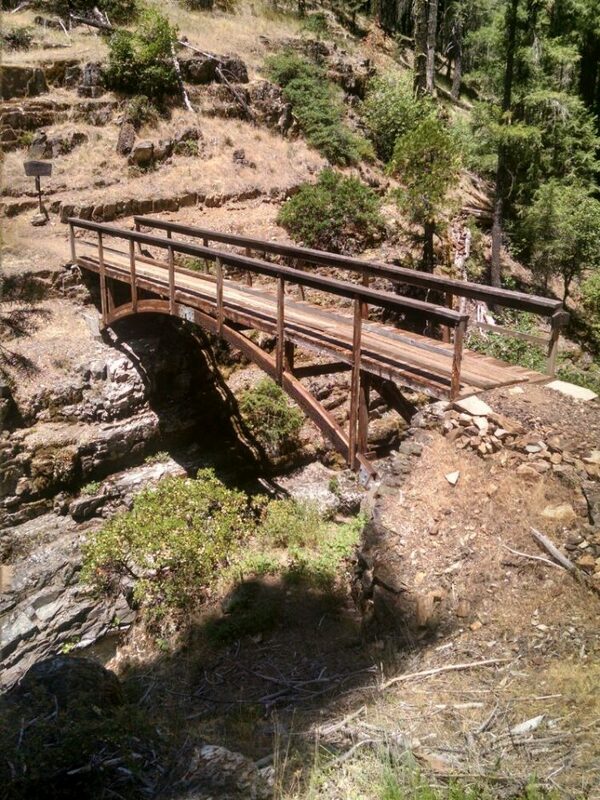 The walk begins with a few miles along steep slopes following Trough Creek, with a crossing at a bridge. 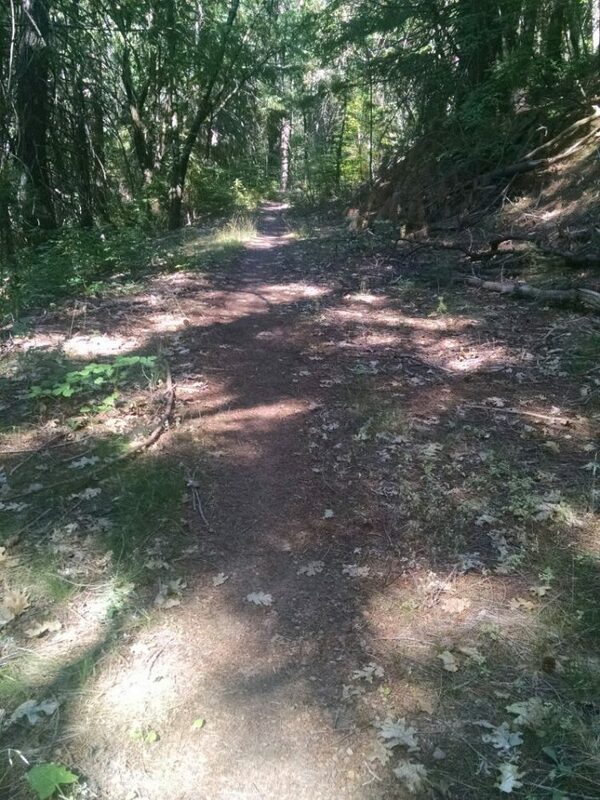 Then the trail uses a repurposed abandoned road. I was hoping for more of this– a pleasure to walk. 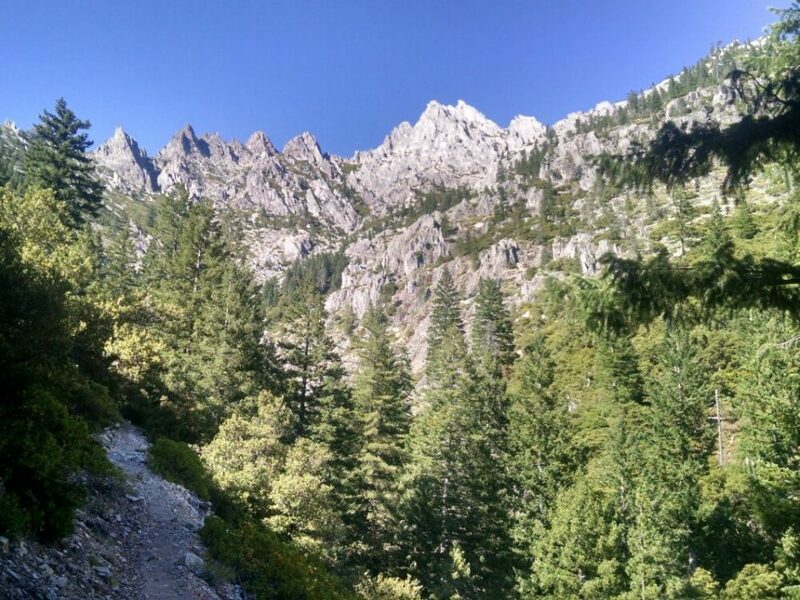 Then more steep slopes along Squaw Valley Creek, with another crossing. 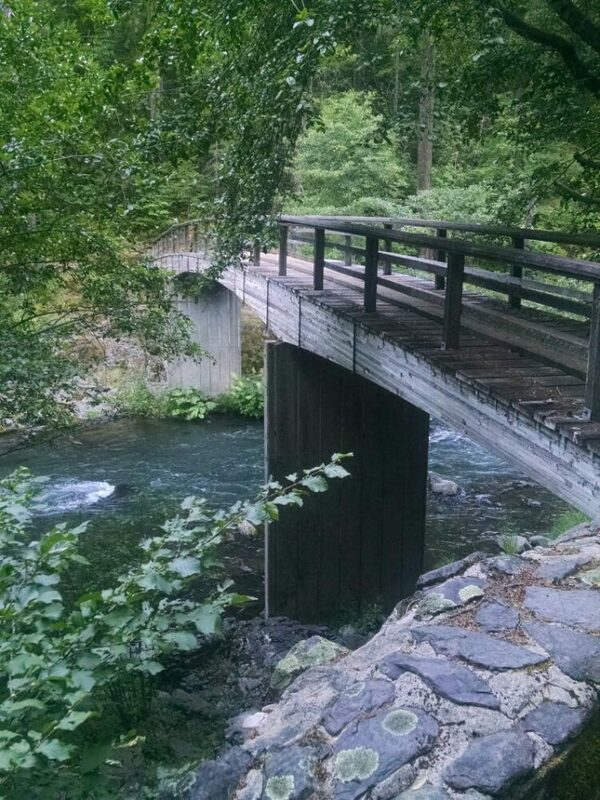 The bridge had deep pools of water at the bottom– so tempting to jump in. I later learn that Salty did jump in here! 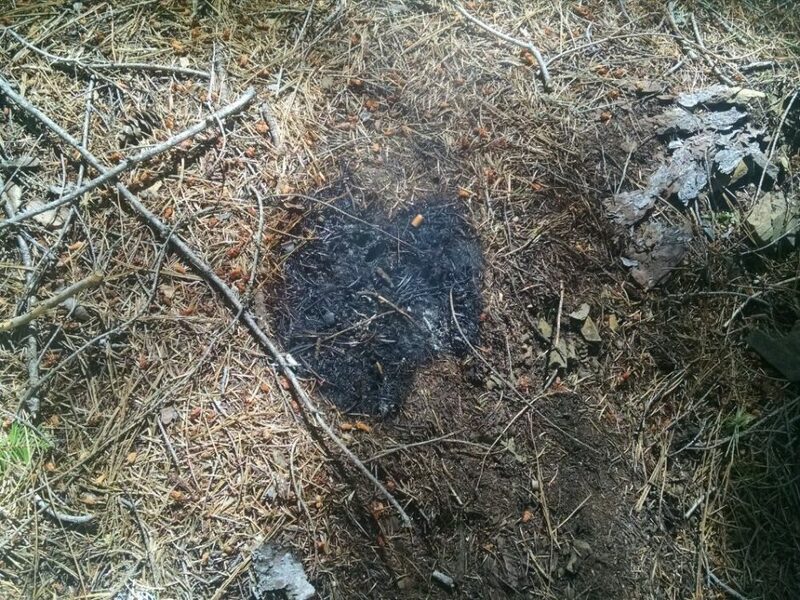 I come across the big surprise for the day, a one foot diameter patch of smouldering pine needles along the trail, with a cigarette filter, with a gentle breeze to keep it growing, near plenty of kindling. I try to put it out with all my remaining water, but the fire is stubborn (like burning old horse manure back home). You keep stirring it around looking for hot spots, and another one appears that you had missed. 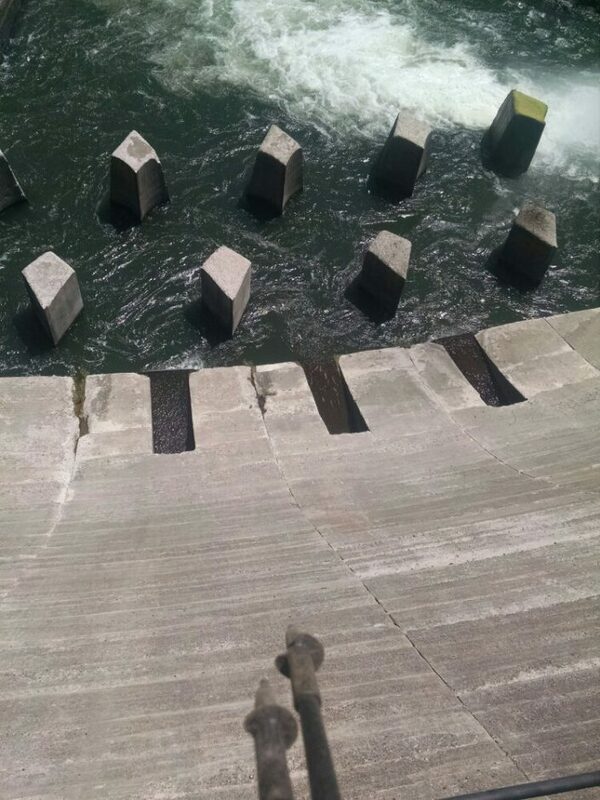 The next water was six miles away. 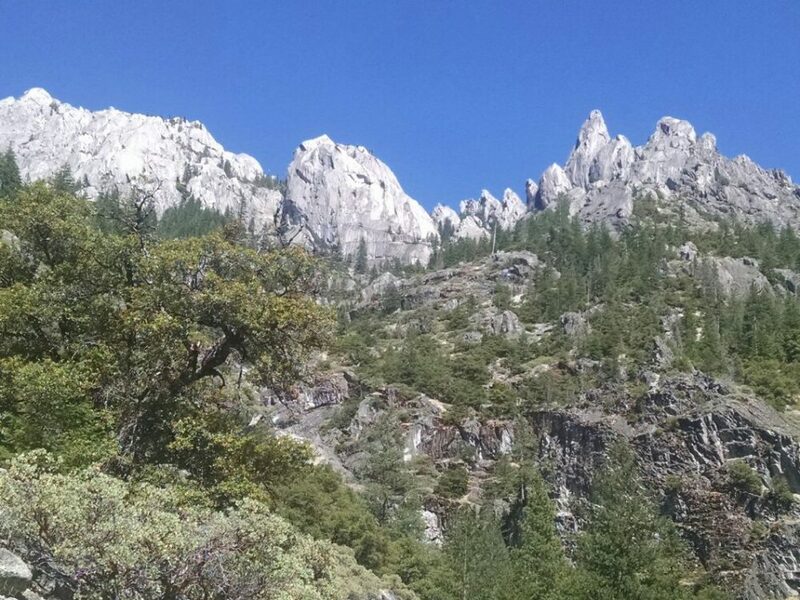 I get a view of Castle Crags, an impressive rock formation we will get closer to tomorrow, at a state park. 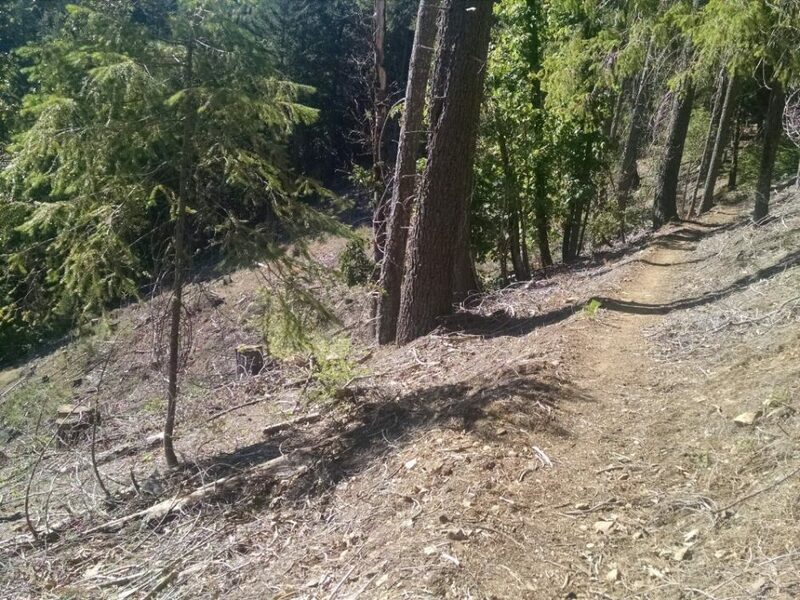 Here is an example of clear-cutting right up against the PCT. I did not think they would get this close. 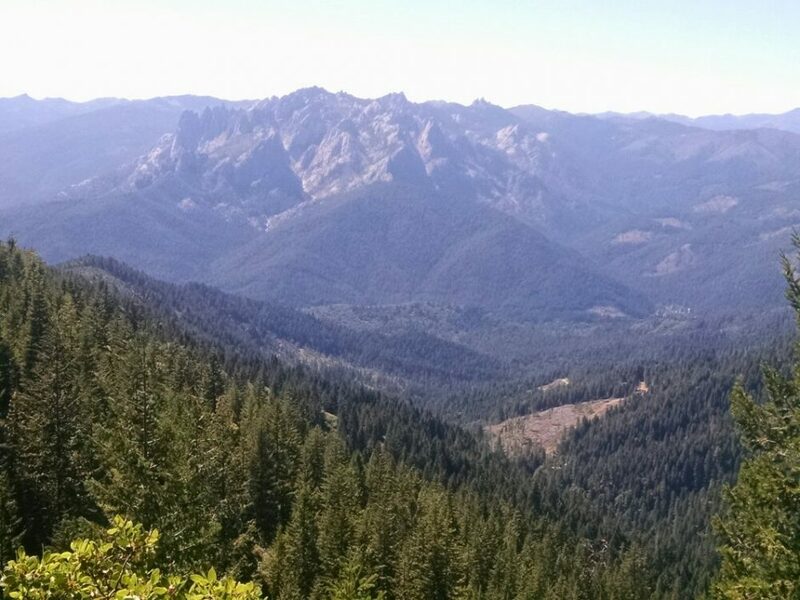 The slopes for this logging are really steep, which must be a challenge for loggers. I see Salty at the next to last campsite to the interstate, and we try to coordinate contacting the same trail angel to get a ride into town in the morning. He did not see Wifey, and I have not seen him today since breaking camp. Puzzled. PCT 2018 Day 67, June 28, Thursday. Walk a few miles, cross a road. Walk a few miles, cross a road. At one road a logging truck zoomed by, loaded up with immense logs, so watch those road crossings. 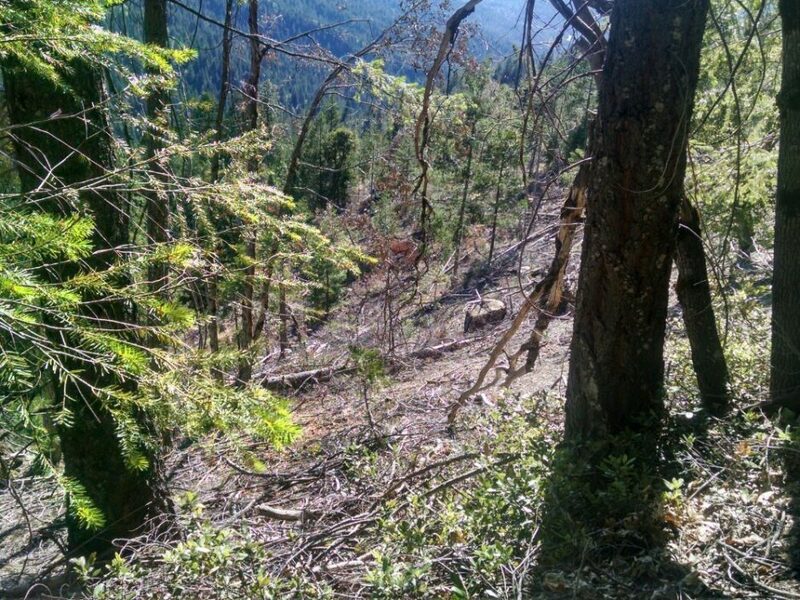 You may be able to make out clear-cutting patches in the photo. The elevation stayed fairly level at 5k most of the day, dropping to 3k at the end. 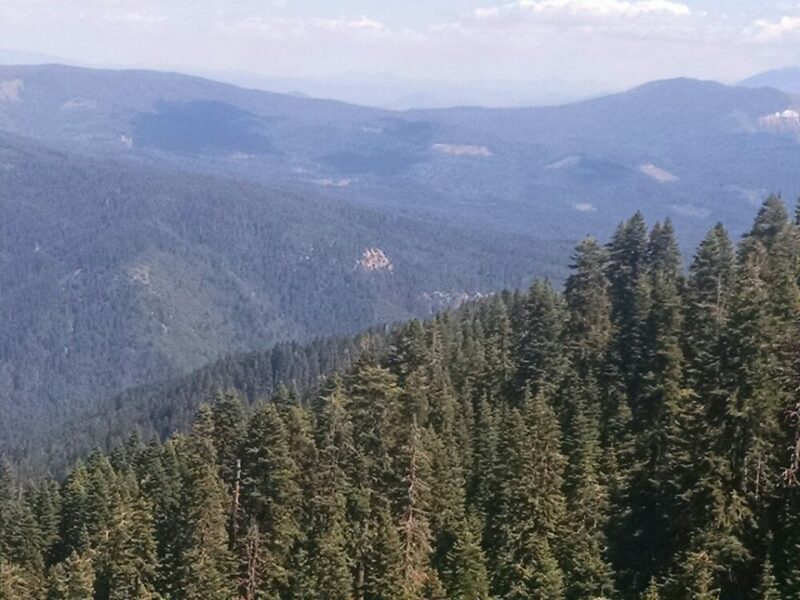 Not many views today, except Mount Shasta grows ever larger. Wifey arrives at the campsite soon after me, and we discuss strategy for the next resupply. PCT 2018 Day 66, June 27, Wednesday. 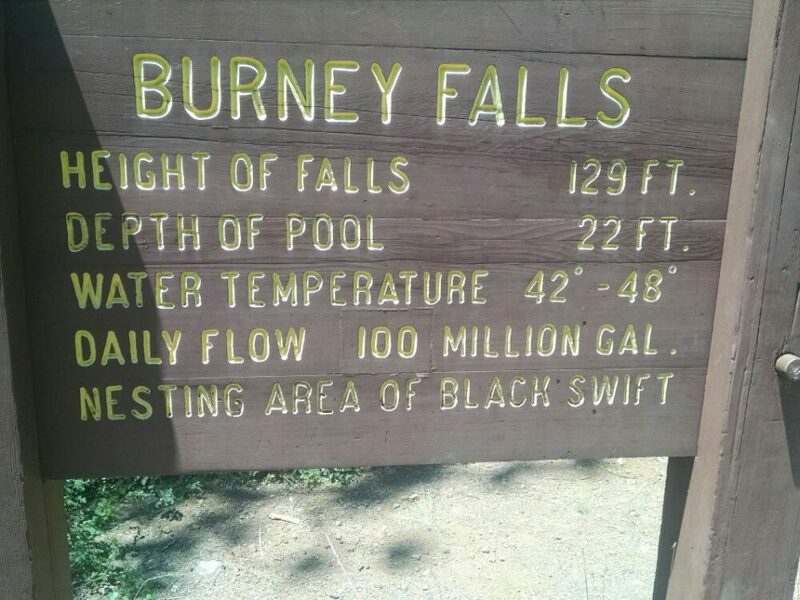 Start mile 1407.3, then off-trail 0.4 miles to Burney Mountain Guest Ranch. Duke, playing next to my pack, is a six-month-old puppy. 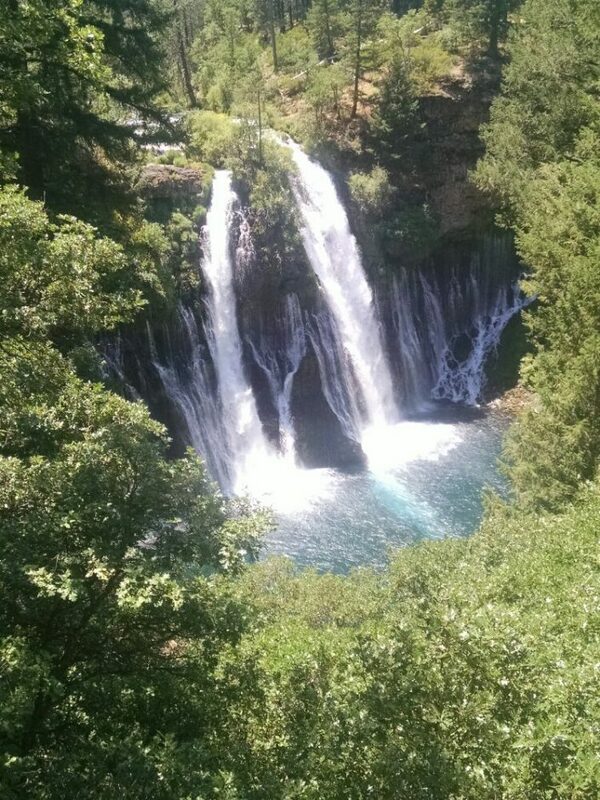 I stop at Burney Falls state park to pick up two equipment packages mailed to me, and to enjoy snacks. Wifey, JP, Salty, Foodie, and other hikers gathered at a picnic table to rest from the heat. 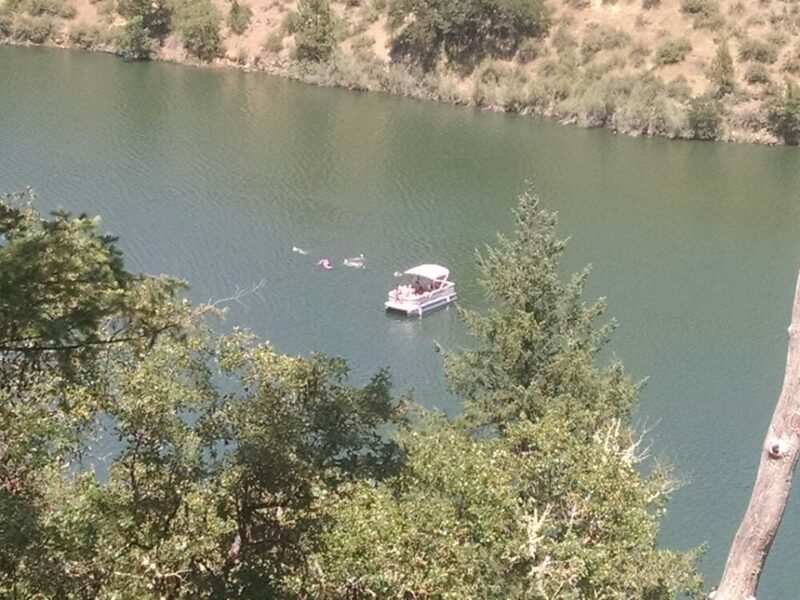 A pontoon boat is on Lake Britton. You cannot see in the photo, but a group of Lutheran ministers are standing around a charcoal grill. 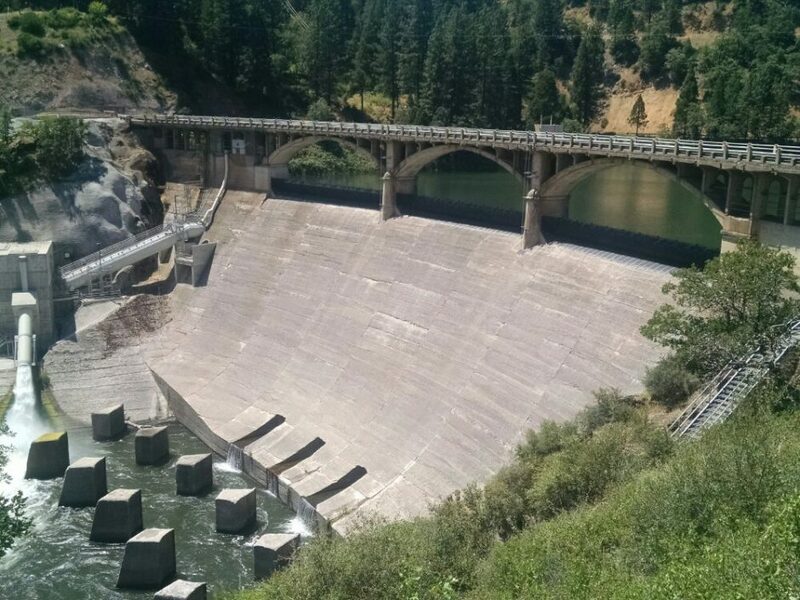 Wifey and I arrive at Britton Lake Dam at the same time, and marvel that the trail shows such unexpected items each day. After an afternoon of climbing gradually from 3k elevation to 5.5k, through some sections of overgrown trail needing a trim, I stop at group of campsites at an exposed campsite with a view of Mount Shasta, where four other hikers were already camped, including Salty and JP.